High Resolution: Yes; Widget Ready: Yes; Compatible Browsers: IE10, IE11, Firefox, Safari, Opera, Chrome, Edge; Compatible With: WPML, WooCommerce 3.1.x, Visual Composer 5.1.x; Software Version: WordPress 4.9.x, WordPress 4.8.x; ThemeForest Files Included: PHP Files, HTML Files, CSS Files, JS Files; Columns: 4+; Documentation: Unrated; Layout: Responsive. Cleanmate is fully responsive which means each and every page element is 100% responsive and adapts perfectly for any mobile device. Responsive mode can be disabled in Theme Options Panel. It's super easy to customize or build your own slider with included #1 Top Selling Slider Revolution Responsive WordPress Plugin with a value of $25. Cleanmate is retina ready. Your site will look crisp no matter the display your user is on. Would you like your clients to have a tool to estimate the cost of home cleaning, garden services, windows cleaning, home renovation? Just name it and build your form with Cleanmate Cost Calculator tool. Cleanmate comes with smart sticky setting available for any column. It makes a column float and can be used for columns on long pages. The Theme comes with different page headers to choose from including centered or left aligned logo and a semi-transparent header with a background image or with an opaque light background. It's super easy to build any page layput with included #1 Top Selling Visual Composer: Page Builder for WordPress with avalue of $34. It comes with 25+ custom Cleanmate components and we keep it up-to-date. Cleanmate comes with a base of 65+ Page Builder components including unique and dedicated Cleanmate components such as Cost Calculator components, testimonials, post carousel, services, team members, projects, timeline, clients list, etc. Each content element comes with rich options so it's super easy to build unique and beautiful layouts. The Theme comes with 94 Premium Font Icons. In Theme Options Panel you can change the color scheme for the entire Theme including icons. Build your own online shop with WooCommerce integrated with Cleanmate. - Online Cost Calculator a unique tool which allows you to easily create price estimation forms to give your client idea of the cost of your service. Support is conducted through our Support Forum . We're in GMT +1 and we aim to answer all questions within 24 hours in weekdays. In some cases the waiting time can be extended to 48 hours. Support requests sent during weekends or public holidays will be processed on next Monday or the next business day. Premium images used for live preview purpose (not included in downloadable package). CleanMate - Cleaning Company Maid Gardening Template; Auto Spa - Car Wash Auto Detail WordPress Theme; Portada - Elegant WordPress Blogging Theme; Fable - Children Kindergarten Template; Auto Spa - Car Wash Auto Detail Template; Car Service - Mechanic Auto Shop WordPress Theme; Car Service - Mechanic Auto Shop Template. Keywords: car cleaning, clean, cleaning, cleaning products, commercial cleaning, gardening, green spaces maintenance, house cleaning, housekeeping, janitorial, laundry, maid, move in out, post renovation, window cleaning. 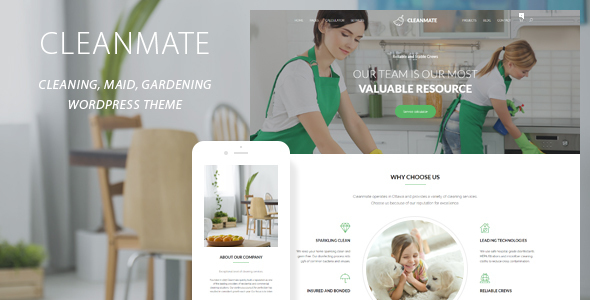 Premium ThemeForest CleanMate Cleaning Company Maid Gardening WordPress Theme 20981913 WordPress Themes, Website Templates, Mobile Themes, Flash Templates & Scripts from creative professional designers. Full details of ThemeForest CleanMate Cleaning Company Maid Gardening WordPress Theme 20981913 for digital design and education. ThemeForest CleanMate Cleaning Company Maid Gardening WordPress Theme 20981913 desigen style information or anything related.